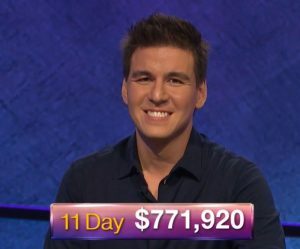 Robert is a Patreon supporter of The Jeopardy! Fan (and Complete The List). You too can contribute! Correct response: Who are the Beatles? The two songs were “A Hard Day’s Night” (No. 1 in August 1964) and “Eight Days A Week” (No. 1 in March 1965). Both song titles are often attributed to the malapropisms of drummer Ringo Starr, but in the Beatles Anthology book, Paul McCartney attributed the title of “Eight Days A Week” to a chauffeur who was driving McCartney to John Lennon’s house. 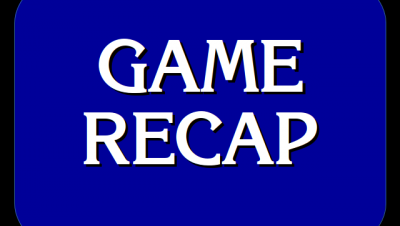 19 Comments on "Today’s Final Jeopardy – March 27, 2018"
so much for your hope that Lisa’s bet last week would make everyone study wagering cause that never happen aslongs as game like this happens with the leader not covering. for the record, there’s no way that anyone at this taping would have seen what Lisa did in hers. true but what it does it shows other people that the leader don’t always cover and tell them they need to go all in cause you never know what the leader is thinking. Alex seems to know, because he started saying “The Beatles ” a fraction of a second before Robert’s answer was revealed. It seems to me that Alex – at least AFTER the music stops- knows the answers by the contestants and probably also their wagers? After all, he has already the card in hands that has all the info. He does not wait for the answers or wagers to be revealed but reads them off. True, you don’t know BEFOREHAND what somebody may wager. What was Katy thinking? This wager was plucked out of thin air and did not cover against anybody, not even Johnny. On the bright side at least the DDs were answered correctly and no clues were left. I can often see why in some situations where a leader might bet small, possibly anticipating mind games out of a trailer. But this situation was one where 2nd place had significant incentive to make a large bet — namely, to protect against third — and thus it seemed like a poor read of the situation at hand by the leader. I see the text above which says “Robert is a Patreon supporter of The Jeopardy! Fan (and Complete The List)”. 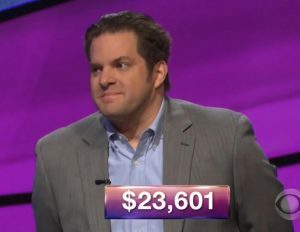 It’s great to see that his enthusiasm for watching Jeopardy, and support for the site, has led to victory in a televised game! Congrats Robert! Today’s champion looks a lot like a contestant who was on a rerun today of The Chase on the Game Show.Network. Anyone know? 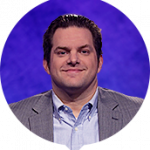 He is one of the winners on The Chase, winning a third share of $110,000. I thought I recognized him from The Chase (I watched the rerun today) because of the way he claps his hands. The lyrics of Eight Days a Week are about a guy loving his girl, no? It seems like a stretch to say that is a heavy work load. The clue didn’t say anything about lyrics. The clue said titles. There’s a difference. The title inspiration of both songs are in the post above. 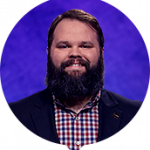 Andy, the only thing wrong with that Final Jeopardy was the unfathomably poor wager by Katy! Personally, I would rather risk losing every time due to a wrong answer than to lose despite leading and getting FJ correct! I believe Mark Barrett posted links elsewhere in this comment section.